Cats can get stressed out in a variety of situations. Things like loud noises, trips to the veterinarian, or having strangers enter the home can induce anxiety in cats. Other things that may cause stress for your feline include moving to a new home, or the arrival of a new pet or baby. Cats that are anxious can exhibit a variety of unwanted behaviors such as eliminating outside of their litter box or being excessively vocal. Anxiety can also cause more serious issues such as excessive grooming, becoming lethargic, vomiting or hiding. Fortunately, anxiety in cats can be treated with a variety of cat calming aids. One option is to try a cat calming treat. These special cat treats are formulated with ingredients that can help a pet to relax, thus warding off any unwanted behaviors that can result from feline anxiety. Chewy's online pet store offers a variety of cat calming chews and treats for cats that can help your pet to relax in stressful situations. The Ark Naturals Happy Traveler soft chews are cat calming treats that are easy to administer. They are made with an all-natural herbal calming formula and are free from wheat, corn, soy, yeast and artificial colors, flavors and preservatives. 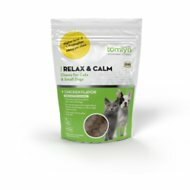 The Tomlyn Relax & Calm chicken flavor supplement is a cat calming treat that contains chamomile, ginger and L-tryptophan. 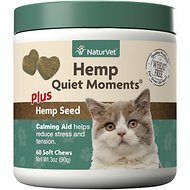 This blend can help to soothe your cat for car trips, going to the vet, bouts of separation anxiety, motion sickness and exposure to loud noises. 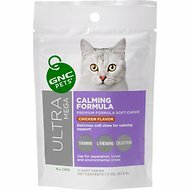 And the GNC Pets Ultra Mega Calming Formula soft chews are cat calming treats that are chicken flavored and easy for a cat to digest. The VetriScience Composure Behavioral Health Bite-Sized Cat Chews begins working in 20-30 minutes and has the chicken liver flavor that cats love. Shop Chewy for all of the best cat supplies!